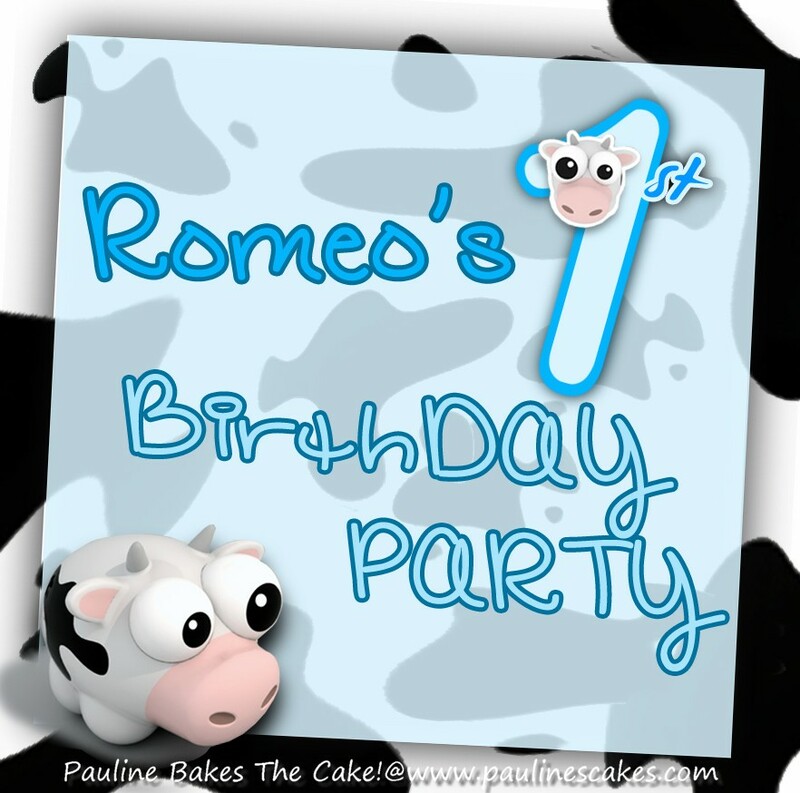 I was commissioned by this lovely client to design a two tiered cake together with 30 cupcakes for her little boy Romeo's first birthday party. 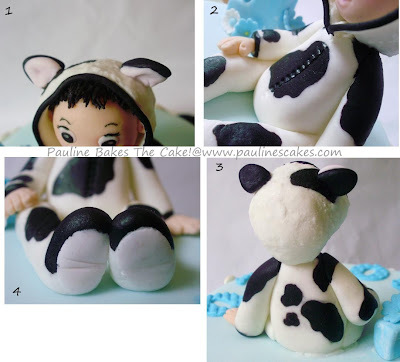 The cake designs are to be based on the "Baby Blue and Cow Print" theme of the party. The banner and invitation card, courtesy of Romeo's mom. I love this little guy so much, I gave him his own photo shoot! Clockwise from top left corner : 1. Peek a Boo (or Peek a Moo)! 2. Yoo Hoo! Now you see me. 3. Whee! I love to slide. 4. Legs up! Exercise is good. Mom sent me this photo of the cow suit for my reference. Mom's lovely idea to add these! Notice each cow face is unique? 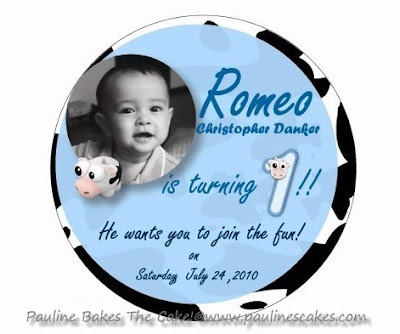 ... and an assortment of "cow print" and "1st" cupcakes. Mom made my day twice! She sent me a message on Facebook, "Thanks a lot for the cake!! Everyone loves the cake." and another via email, "We all were really happy with not only the cake design, but also with your cake. It is really delicious". Oh my gosh I love this! Thanks for the inspiration. 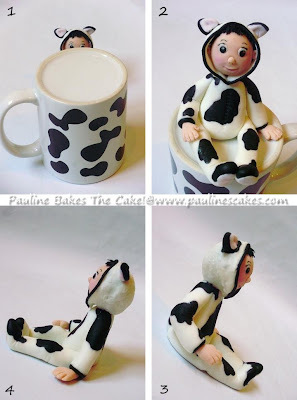 Hi Pauline, I love your figurine, so much that I'm doing a bear one for a friends son 1st Birthday and wanted to know how you did the hood part, if it's not to much information? 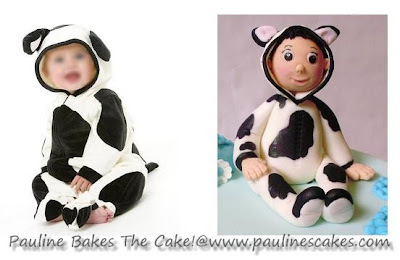 Was there some type of template you use to make the cow hood, I'm making a little boy in a bear suit and was wondering if you can help in any way? No, I didn't use any template for the hood. Just roll a piece of sugarpaste shaped like a half circl, thinly and fit it over the head. 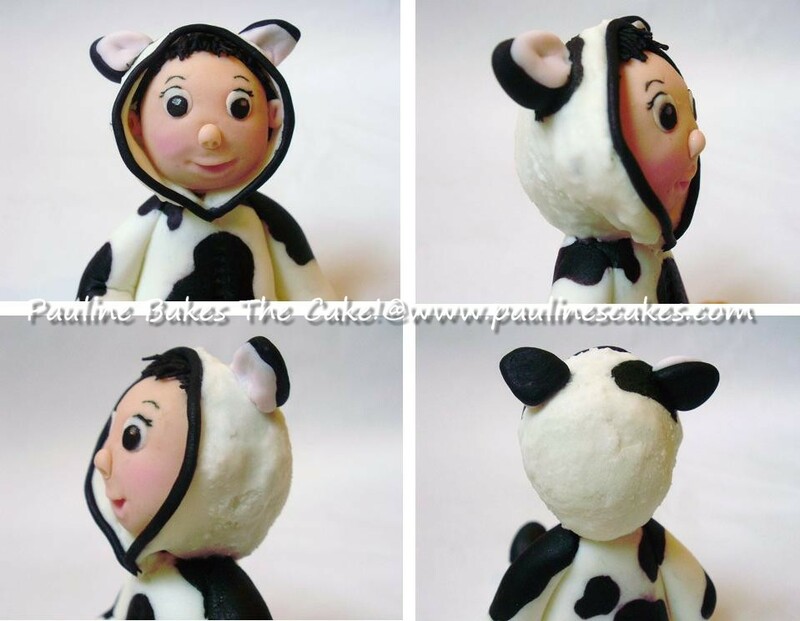 The excess sugarpaste at the back of the head can then be sniped off with scissors.